Keeping up with The Caseys: Has anyone else contemplating buying their human baby, dog toys? Nursery sneak peek. Has anyone else contemplating buying their human baby, dog toys? Nursery sneak peek. 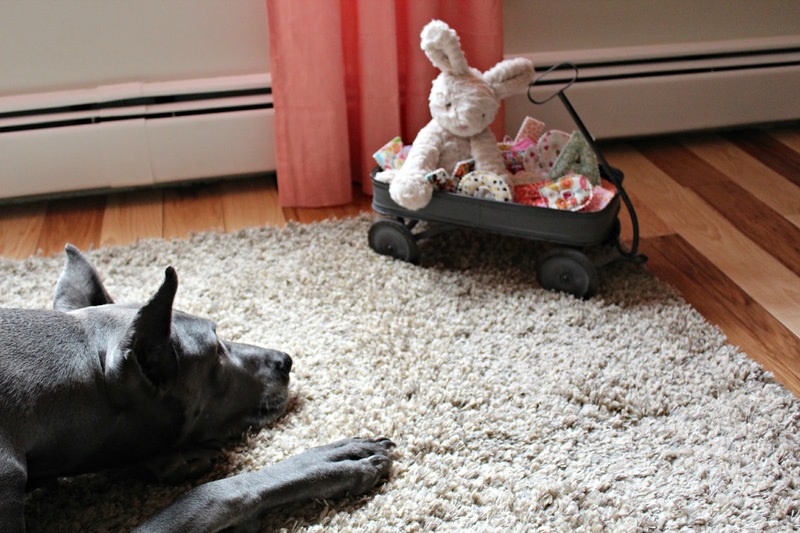 How do you come home with a $22 JellyCat stuffed bunny, put it in a wagon, on the floor, and expect your fur child to not think that it's for her. This whole sharing stuffie things is going to be much harder than we anticipated. Graycie has always loved her stuffies. We call them her "babies". We will tell her "Go get your baby" and she grabs them, snuggles with them and carries them with her. We will not be calling our baby, "baby" when she arrives. Today, I put the first stuffed animal in the nursery. Graycie grabbed at that bunny's head 4 times and finally won. Wet, matted, 22 dollar bunny goes back into the wagon. This is when I snapped this photo. Apparently, she is just going to admire it. As I was typing this, she did go back up the stairs to the nursery to snoop some more, however the door was shut. Nosey. I have realized in the past 20 minutes that my human baby and fur child (horse dog) are going to share everything. Food, binkies, and stuffies. Some that are squeaky dog toys stuffies and stuffies that are expensive baby toys. Graycie loves socks, so I'm sure socks and bibs are going to go missing like crazy. This has also made me think about how much dog hair my human baby is going to ingest. Thank GOD, that I am more of a relaxed person than a germaphobe. Has anyone else contemplated buying their human baby dog toys? I mean they squeak, are cheaper and durable....jk. 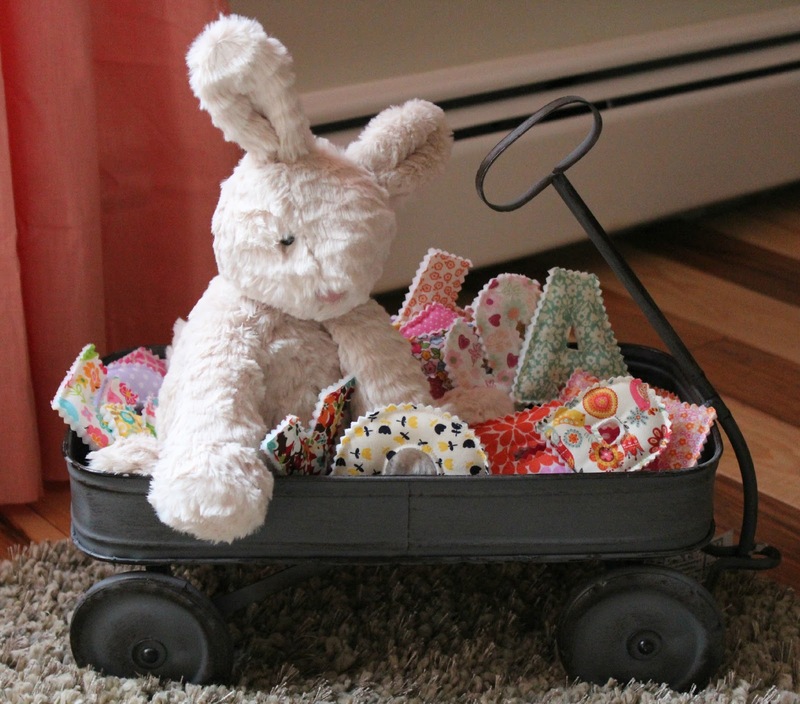 Here are a few peeks at the nursery! My sister bought our baby girl her nursery. We are so happy, thankful and beyond excited!!! My sister is going to be the best Auntie ever. 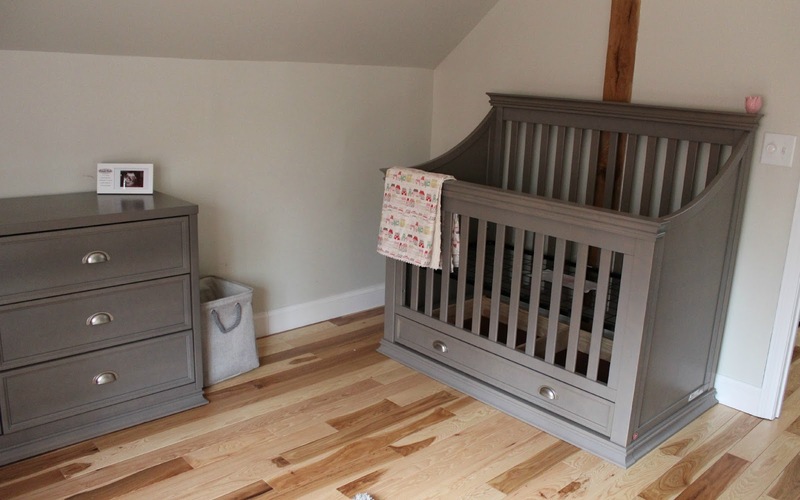 The nursery is from MDB. It is the Mason collection. 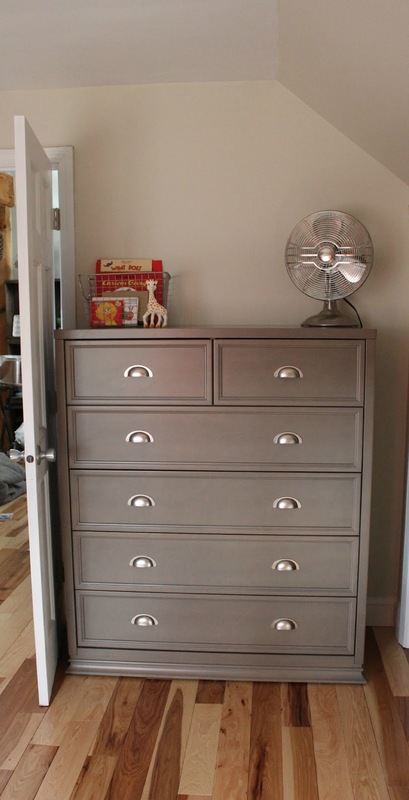 My girlfriend bought 2 pieces of this exact set for her nursery and we loved it! I contemplated on making a rag rug for this room. Coral, cream and grey are a very tough color scheme to pull together and I thought combining all of them in the rag rug would be amazing. But after reading the DIY on pinterest and learning that a 2x3 rug took one woman her entire pregnancy to finish, I gave up. 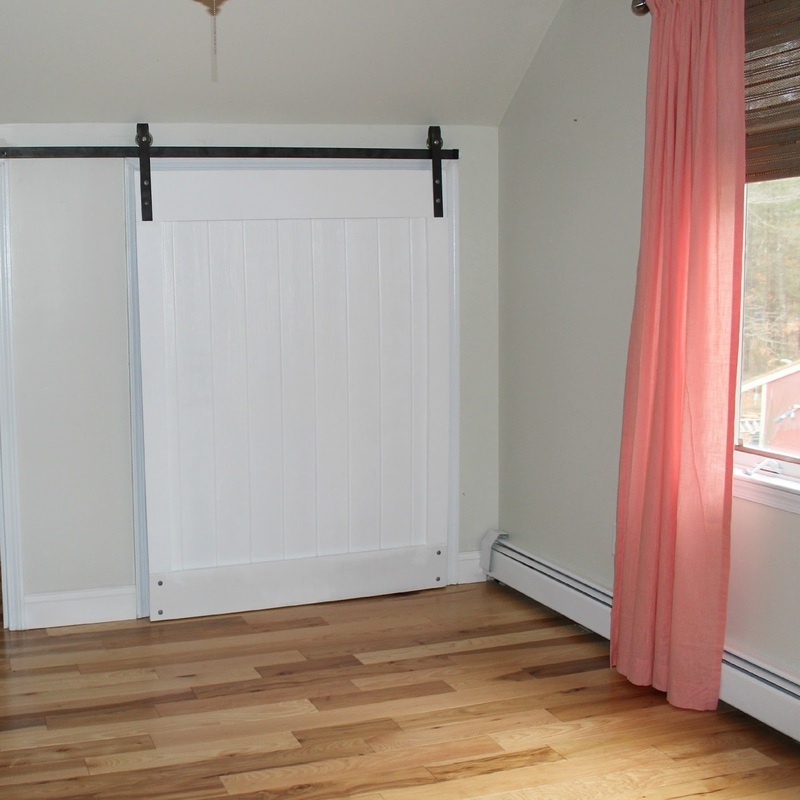 This is the sliding barn closet door that the hubs custom made. I am absolutely IN LOVE with this. We still need to find a handle. There is a closet to the right of it that will have new shelving shortly, however there is a freeze of funds right now due to the central AC being installed. I am also obsessed with these fabric alphabet letters. They are from Yellow Bird + Yellow Beard on Etsy. The quality and detail on these little guys is amazing. You can get them with magnets on the back also, but I figured for now these plush "stuffies" would work just fine. I'm not discussing anything about St. Patricks Day today as I did not get to enjoy a green beer. 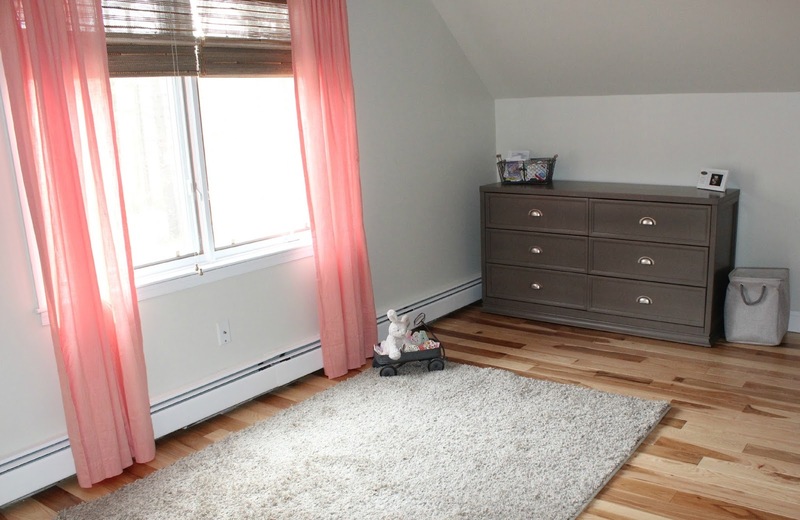 I'm obsessed with your nursery! Also, we took the dog for a ride in the car and all I can think about is how much the hospital people are going to judge me from how much dog hair is in the car seat. Love the nursery furniture you got. Those barn closet doors are just gorgeous. Poor Graycie is being teased with you shenanigans. Don't you know those are her toys. Why do you taunt her so?! Haha! I love the room and the color scheme. Adore it! I love the crib & such.. It is all too darn cute & adorable.. Graycie & the little one will do just find sharing hopefully that is! I will keep my fingers crossed for you all..
Oh, that baby nursery is so precious :) I love the color scheme you chose. I want your house! Every time you post a room I want to move in! Love it. 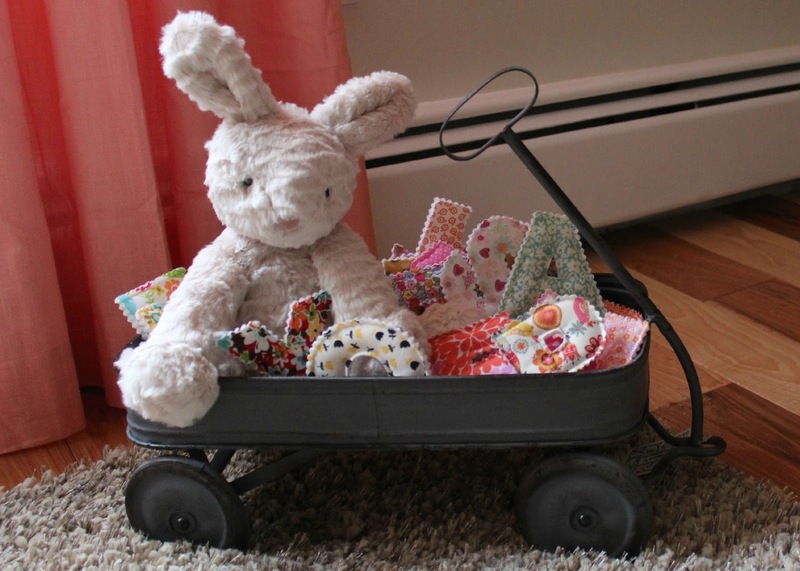 Your nursery looks amazing. I also LOVE those stuffed letters! I think I need some! And your child will ingest endless amounts of dog hair. We have a cat and a dog and I am always finding fur in between teeny little fingers and in her mouth. Her new thing is "kissing" Rocky by basically making out with his back. Before that she would just sit there with her mouth open and tongue out while he licked her mouth. Gross but actually pretty adorable.